High winds produced dangerous, 10- to 15-foot waves along the lakefront path, knocking down morning bikers and runners. Police closed off the path early Friday from North Fullerton Avenue, but some runners and bikers didn't heed the warnings, according to News Affairs. 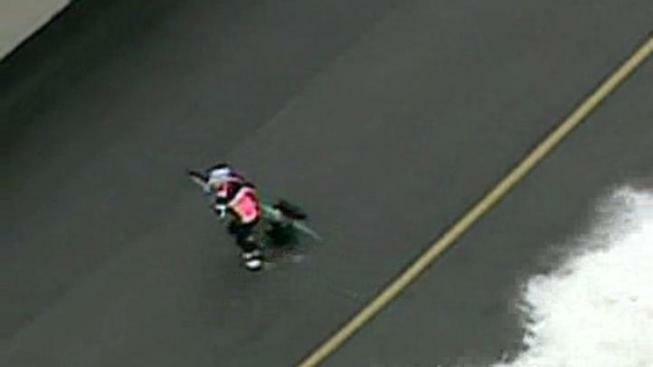 NBC Chicago helicopter footage showed several people taking spills into the waves, though no injuries were reported. By 9 a.m., police were standing at the path to reroute bikers and runners. The path will remain closed until further notice, they said. Huge waves as high as 10 to 15 feet closed Chicago's lakefront paths Friday morning. Here's what it looked like from a runner's perspective. "Unfortunately, people are not paying attention to barricades. Those are up there for their own good and people continue to cross the barricade, jump over the walls, for whatever the reason," said Office of Emergency Management and Communications Director Gary Schenkel. There are plenty of other paths in Chicago they should be taking. This is a safety issue," he added. Overnight, 30 to 35 mph winds with gusts of up to 50 mph hit parts of the area, knocking out power to about 27,000 ComEd customers. The strong winds also were blamed for a building collapse in Little Village and a fire in Glenview, among other local damage. Gusty wind continued Friday even after an advisory expired at 5 a.m. for the metro area.